PHUKET: Earlier this week the government announced plans to request B60 million to develop bike lanes in three different locations in Phuket. The announcement follows Thailand breaking a new mass cycling Guinness world record last Sunday (See stories here and here). The push for more cycling and bicycle lanes is a good initiative to promote a cleaner environment and healthy lifestyle. But it does beg the question about how prepared Phuket and the rest of the Kingdom will be to accommodate such an ubiquitous cycling culture. It’s no secret, Thailand is renowned for its dangerous roads (drivers) having consistently been ranked in the world’s top five for countries with the highest number of road fatalities per capita. There are a number of problems that contribute to road accidents, be it poor roads, traffic engineering, reckless driving, or lack of accountability or traffic law enforcement. And cyclists are arguably the most vulnerable of commuters on the roads, as many headlines remind us. Back in April, a woman cycling on a road north of Phuket and was killed by a pickup truck overtaking illegally. In February, a Chilean cross-continental cyclist who planned to complete a world record this year was killed when he was hit by a pickup truck in Northeastern Thailand. And, still sour in memory from two years ago were the two world-famous British cyclists killed on the road by a pick-up truck, east of Bangkok. The list goes on. 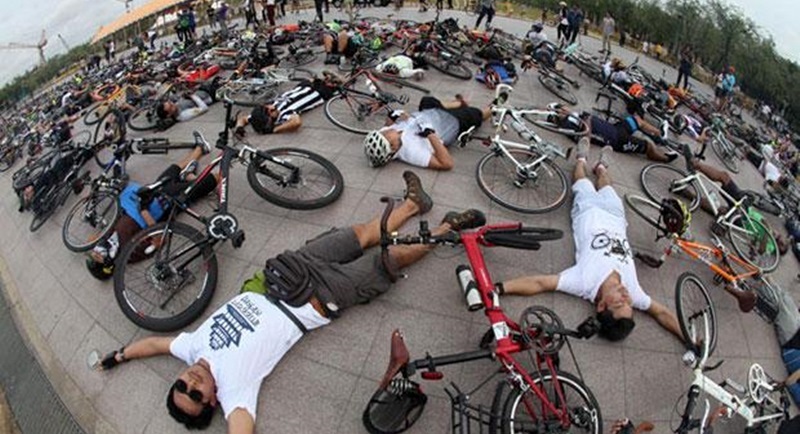 In May this year a cyclist was killed after a car rammed into a group of bikers in Bangkok. The fatal accident was the second in 40 hours, as a few days earlier in Chiang Mai, a drunk, 23-year-old student rammed her car into a group of cyclists, killing three and injuring two. But these are just a few fatal examples of the many accidents that happen daily on Thailand’s roads. Each case underlines just how many challenges we face on a bumpy road ahead. Creating more bike lanes is a positive initiative, but it certainly won’t be enough – for how can cyclists be assured that they will not just become the next “tragic” headline? The short answer is, they can’t be… not yet, anyway. We also need to push for more traffic-violation enforcement, driver’s education, and above all, accountability. unless these lanes are to be constructed with a seperating kerb then there is zero point in wasting the money.. existing cycle lanes are already obstructed by cars, vans, motorbikes and lorries using them as handy parking areas.. with no enforcement of the parking laws i cannot see this changing..